Reviewed on: PC. Copy supplied by publisher. 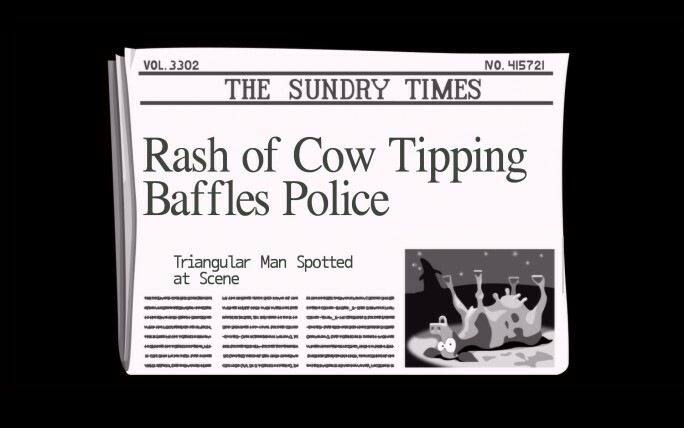 There’s certainly never a dull moment in Day of the Tentacle Remastered. Few games, or heck even novels or films, can say they allow one to seamlessly jump from tricking George Washington into chopping down a kumquat tree, to staging a jail break right under the nose of the IRS to getting a mummified entrant ready for the Annual Human Show in the year 2193. You think that sounds nuts? Wait until I tell you it’s all done in the name of stopping a mutated, sentient tentacle from taking over the world. 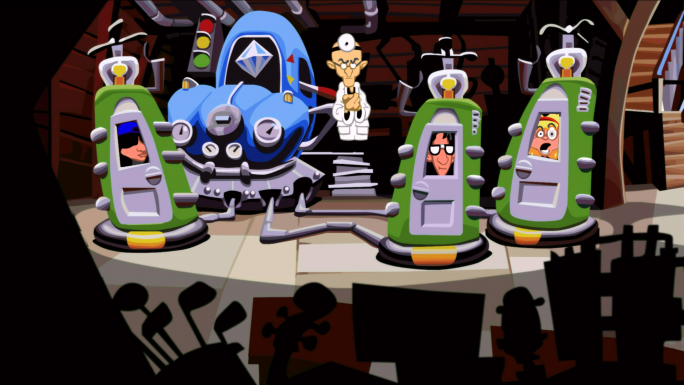 Originally released in 1993, Day of the Tentacle tells the story of three friends, Bernard, Hoagie and Laverne, attempting to go back in time 24 hours in order to help an eccentric scientist, Dr Fred Edison, undo his mistake of pumping toxic waste into the nearby river. The reasoning behind this is because one of Dr Fred’s other creations, a living tentacle named Purple Tentacle, decided to drink the waste and subsequently grew tiny arms and gained the motivation to take over the world (as one does once they first gain use of their limbs). If the trio can turn off the toxic waste machine before Purple drinks from it, they may just save the human race from being enslaved by a tentacle uprising. Of course, things don’t go according to plan and they get separated across time. Bernard returns to the present day, Hoagie arrives in the 1780s and Laverne winds up in the 2190s where tentacles rule the Earth. Thus begins the primary struggle of the game: figuring out a way to power each of their respective time machines and get them back to the present. And they need to hurry, the situation is certainly dire. As a huge fan of the original game, I was immediately struck by how amazing the visuals in this remaster are. 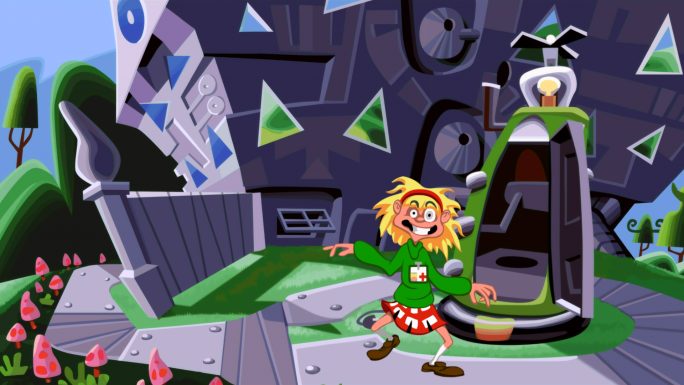 Day of the Tentacle was a 2D Lucasarts point-n-click game, so the original art was bursting with charm but also very pixelated and would be difficult to look at with today’s standards and high-def screens. When this remaster was first announced I was concerned that to combat this they would take a leaf out of the Monkey Island remake’s book and completely redesign the look of the game. Sure, those remakes were fun, but they didn’t feel like the same games we enjoyed way back when. But my worries were swept aside the instant I saw the launch trailer two weeks ago, and even more so when I booted up the game and found it looks just how I remembered it, just much cleaner and popping with colour. It was like walking back into my childhood bedroom, with every exactly how I left it. A much more efficient form of time travel than a DeLorean. 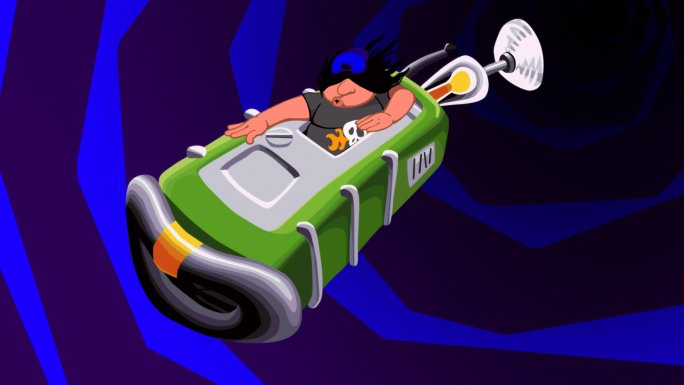 As well as remaining visually faithful to the original, Day of the Tentacle Remastered also keeps all the same dialogue and sounds that long time fans will know and love, albeit with some slight changes. The changes generally only apply to the music, and all they’ve done is made it all sound less like the MIDI files of the early 90s. But as for the voice acting, it’s exactly as awkward, clever and downright hilarious as it always was, though I admit I’m hearing it through rose tinted glasses. Someone coming in fresh might get frustrated by the occasionally stilted delivery, especially when they have to repeat conversations to crack a puzzle as they can’t be skipped. But one thing both old and new players alike can’t miss is the high quality wit of the script from directors Tim Schafer and Dave Grossman, along with Ron Gilbert and Gary Winnick. I’ve been laughing at the conversation between Hoagie and Benjamin Franklin discussing it being too sunny for his kite experiment for the past 20 years, and I certainly cracked up when I saw it again here. And this part. I will always laugh at this part. That conversation is one of the many you have while trying to decipher all the puzzles that make up Day of the Tentacle Remastered. The classic Lucasarts games were built upon the foundation of their zany brainteasers, where sometimes even the most outlandish thing turned out the be the right solution. Some are as easy as saying the right words in a conversation tree, but most of them require combining the uses of various objects to pull off something completely bonkers. Now I have to admit, I remembered how to make it through most of the puzzles since I played the game already decades ago. But what I didn’t remember was how I actually came around to solving them, and I could see throughout my time with this remaster that the clues are everywhere in the dialogue and the environment providing you’re paying attention. Finally, aside from the visual upgrade, the biggest change in this remaster is to the gameplay itself. Lucasarts point-n-click games are known for having their selection grid of verbs at the bottom of the screen, which is no where to be seen in this version. Instead, players can right-click the mouse (or Square on the PS4 version) to open up a wheel of interaction options, thus freeing up the entire screen space to house the game’s stunning artwork. It may remove a staple of the genre, but it works well and makes things feel so much smoother. The weird alteration to the gameplay is the addition of the “object highlight” button, where holding down Shift/Up on the D-Pad, well, highlights all the interactive objects on the screen. This may be seen as a bit nit-picky, but to me a feature like this kind of undermines the point of the game. You’re supposed to explore the space with the cursor, finding what can and cannot be used so as to inform yourself of what may constitute pieces of the puzzles, and having all that just pointed out to you defeats that. And the mouse cursor signals when an object it touches can be interacted with anyway so I have no idea why it’s here. Thankfully it can be ignored. 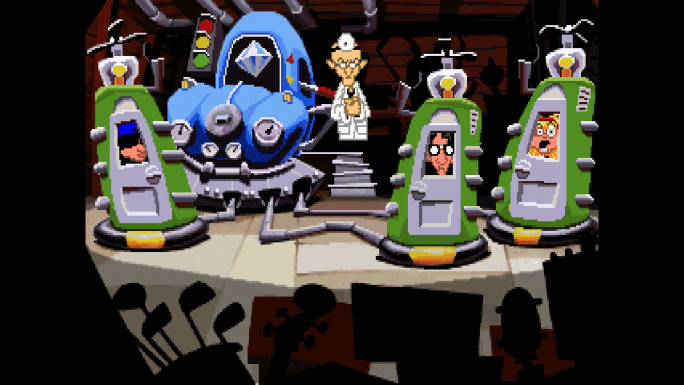 During my time with Day of the Tentacle Remastered, I was constantly thinking: “THIS is how you remaster a classic game.” It revamps the original to modern visual standards, but still maintains the exact same feel that sets off my nostalgia. The dialogue is completely unchanged to the point where I could speak along with the characters at times. The gameplay is tweaked so as to improve the experience, but at its core it is still the same kind of game. It essentially is the same game, only better. 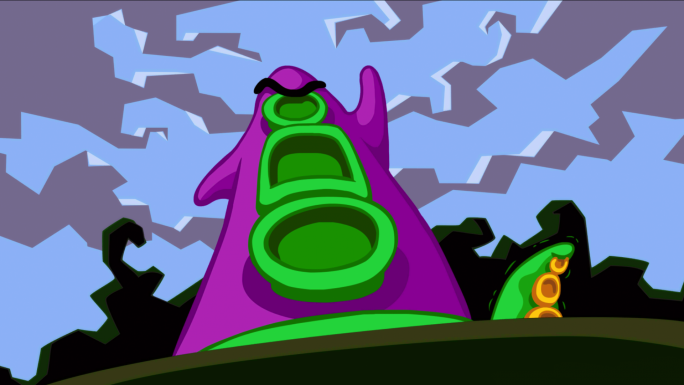 Granted the voice acting objectively may not have aged well enough for new players, and some of the new gameplay additions are pointless, but Day of the Tentacle Remastered is still a staple of its genre, one that spawned the likes of Telltale Games and Life is Strange. What’s more, as well as reliving the game, there’s also a developer’s commentary that provides a great insight into making it. I honestly cannot encourage people to try this game enough. Cons: …that is admittedly a little bit stilted at times, and can’t be skipped. Unnecessary gameplay additions. 9/10 – A must play. Send your entries into the Human Show to Tom on Twitter: @tomdheath. Also be sure to follow LoadScreen on Twitter, @load_screen, and like on Facebook.